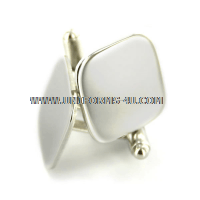 Our silver cuff links are suitable for a variety of uniform styles across a broad array of military branches. 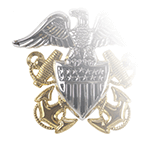 In the United States Navy, silver cuff links are worn only by enlisted Sailors at the rate of E-6 (Petty Officer First Class) and below (they may also wear black cuff links, available here). Both male and female Sailors are required to wear cuff links with the Dinner Dress Blue/White Jacket uniforms; their wear is also mandated for the Female Dinner Dress Blue uniform. Similarly, Coast Guard Auxiliary members are authorized to wear plain silver cuff links with the Dinner Dress Blue Jacket uniform. 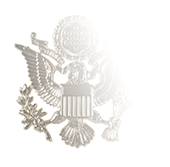 The Air Force has the most expansive rules regarding the wear of silver cuff links. Cuff links are mandatory with all varieties of the Mess Dress Uniform (Men’s, Women’s and Maternity), and any studs worn must also be silver. 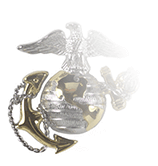 (Officers are required to own a Mess Dress uniform.) Cuff links are an optional item on the Men’s Semi-Formal Dress and Service Dress (Class A) uniforms and on the Men’s Long-Sleeve Blue Shirt. For female Air Force uniforms, cuff links are optional on almost variation with the exception of utility or combat outfits. 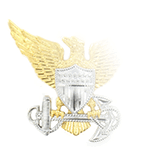 Their wear is permitted on the Women’s and Maternity Semi-Formal Dress uniforms, the Women’s and Maternity Service Dress uniform (although the blouse requires modification at the Airman’s expense to accommodate cuff links), and the Women’s Long-Sleeve Shirt and Long-Sleeve Blue Maternity Blouse. 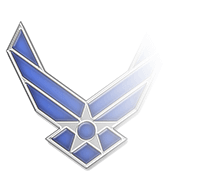 Please note that the Air Force requires that cuff links and shirt studs have the same finish. We carry mirrored silver shirt studs that match these cuff links—click here to purchase.